For the NES game with the same name, see Action 52. Action 52 is a compilation of games for the Sega Genesis. It was developed by FarSight Technologies and published by Active Enterprises. 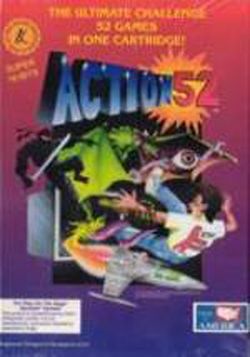 This version of Action 52 features a different lineup of games, some with more work put into design and fewer technical issues than the NES version. Each game is color-coded on the main menu screen; "Beginner" games are displayed in a green font, "intermediate" games are displayed in a purple font, "expert" games are displayed in a yellow font, and multiplayer games are displayed in a blue font. In addition to the 52 games listed above, the Mega Drive/Genesis version features a music test mode, and a "randomizer" option. If selected from the main menu, the randomizer will randomly choose and start one game from the 52 available on the cartridge. The fifty-second game, Challenge, is an endurance test to see how long the player lasts in a random series of the highest levels of the other games. Several new games were introduced in the Sega version. A number of these have the same name as games on the NES cartridge, although they are not the same game; the Sega Haunted Hills, for instance, is entirely different from the NES Haunted Hills. Other games feature other changes, including a version of The Cheetahmen in which the titular Cheetahmen rescue captured cheetah cubs from monsters, which is completely different from the original NES game. The bosses from the NES version appear as enemies. This page was last edited on 26 May 2014, at 20:55.